In the most of applications thermoelectric coolers are mounted on headers, headers are attached to the heatsinks, TECs require a controlled ambience, thus the final assembly is usually sealed with caps or lids. This means in most cases thermoelectric cooler is always a part of an assembly with few or many mechanical parts involved. In some cases it can be easy to use a standard industrial package solution (like TO-8, or HHL for example). But there can be a situaiton, where a customized construction/packaging solution may be required. Construction elements like optical benches, laser diodes (LD) holders, various heat-spreading parts, mounting blocks, heatsinks and etc may require a full development from scratch. And here CNC machining is a perfect solution, especially at trial/prototyping stage. 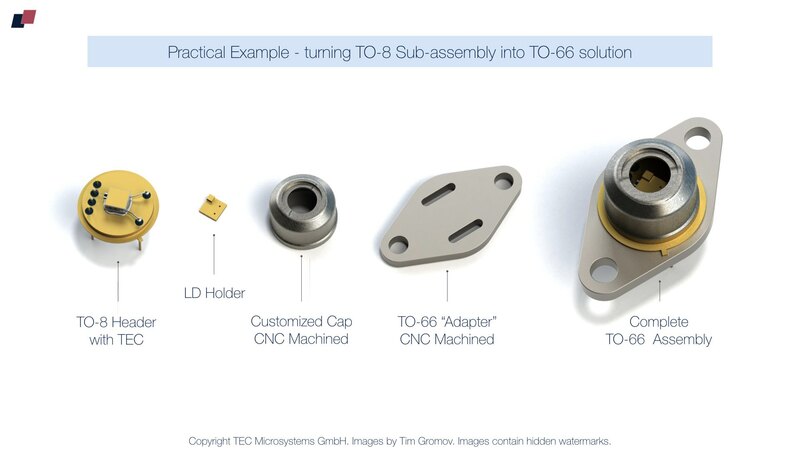 TEC Microsystems GmbH additionally to standard sub-assemblies with TECs offers CNC machining service and customized mechanical parts development to simplify and optimize the development process on customer side. Professional high-precision CNC machining from materials like Kovar, CRS, stainless steel, Copper or Aluminium is avaialble. Quick 3D modeling, fast turnaround with CNC parts machining and Ni or Au finish plating make the development and integrating of thermoelectric coolers comfortable and easy, especially at trial and mid-side batch production. Such flexibility with design and optimization of construction saves time and money saving for end-user, makes the development process more comfortable with less limitations.